A specialist will know how to clean a cast iron range oven, so call us on 01452404600. If you have been searching for the best professional, then you’ve come to the right place. 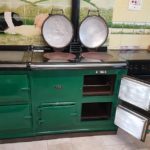 We are happy to help if your precious Aga, Rayburn, or Esse is showing distress after all the Christmas cooking and baking. Other oven cleaning companies will be in and out of your house to a soaking tank in a van. Imagine that in the winter weather! Our system is unique; we work right by the oven, keeping out of the way. Minimum disruption, and safe for children and/or pets. We are a family-run business (not franchisees), and our philosophy has and always will be polite, punctual, and professional. 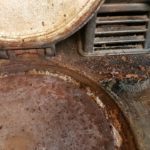 We know how to clean a cast iron range oven, and we know our method is best: a gentle but extremely thorough steam-cleaning process. No nasty scouring, no harsh chemicals. You can see for yourself what splendid results we can achieve from these photographs. 100% biodegradable and non-caustic. Safe for properties where there is septic tank drainage. To endorse our “green” credentials, we drive a zero-emission electric car.